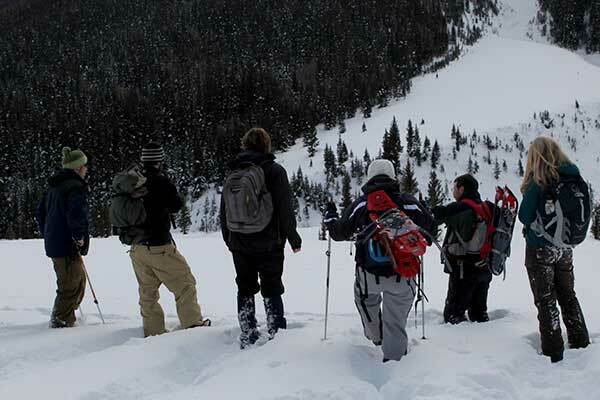 Students learn about winter ecology in the San Juan Mountains from a Colorado Parks and Wildlife ecologist. The Geography and Environmental Studies Department is one of five national finalists for the 2019 American Association of Geographers Award for Masters Program Excellence. The award honors university geography departments and programs that have significantly enhanced the prominence and reputation of geography as a discipline and demonstrated the characteristics of a strong and engaged academic unit. The department has received more than $1 million in research funding throughout the years and was cited in an outside review as a program that “reflects a level of excellence rarely found in regional state university settings.” Faculty members serve on editorial boards for multiple top journals in their areas of specialty, and as board members or consultants for local and regional community organizations. The award-winning faculty include Cerian Gibbes, associate professor, who earned the UCCS 2018 Faculty Award for Excellence in Research and Outstanding Teaching Award from the College of Letters, Arts and Sciences; John Harner, professor, the 2018 CU Thomas Jefferson Award winner; and Skop, who was the 2018 AAG Distinguished Scholar Award in Ethnic Geography. Each of the nine regions within the AAG were limited to two nominations to forward for national consideration, and self-nominations were not permitted. Finalists will submit a dossier to the selection committee by Dec. 31, 2018, with the award announcement in February 2019 and the presentation at the AAG Annual Meeting April 3-7 in Washington, D.C.
Congratulations to the faculty in Geography and Environmental Studies Department! What a well-deserved recognition.